The formation of first wrinkles is closely related to skin micro- tensions. 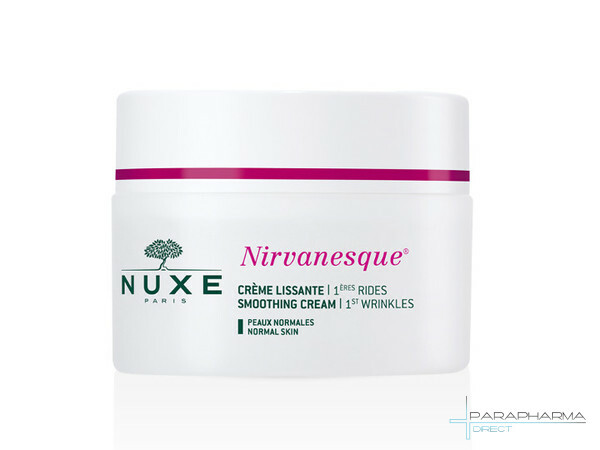 Fundamental discovery : Nuxe Cosmetics Floral expert creates Nirvanesque to instantly and visibly smooth lines and wrinkles by promoting skin relaxation ( and Marshmallow Root Peony , Lotus Seeds and Blue Poppies ) . Immediately, the skin is relaxed and hydrated ( Rosehip Oil ) . The features are d�crisp�s and glowing complexion. Day after day, the first wrinkles are smoothed. Apply morning and / or evening . Formula INCI : Aqua (Water) , Rosa moschata Seed Oil, Glycerin , Propanediol , dicaprylate , Butylene Glycol, Cocao-Caprylate/Caprate , Phenyltrimethicone , Hydroxyethyl Urea , Hydroxyethyl Acrylate / Sodium acryloyldimethyl Taurate Copolymer, Parfum ( Fragrance ) , Arachidyl Alcohol , capryloyl Glycine , tocopherol , Mica , Oryza Sativa (Rice ) Hull Powder , Paenoia Suffruticosa Root Extract, Behenyl Alcohol , Carbomer , Sodium Hydroxide, Citric Acid , Ethylhexylglycerin , Arachidyl glucoside , Dehydroacetic Acid , Allantoin , CI77891/Titanium Dioxide, Tetrasodium EDTA , Polysorbate 60 , Sorbitan isostearate , Althaea Officinalis Root Extract, Enantia Chlorantha Bark Extract, Nymphaea coerulea Seed Extract, Papaver rhoeas Seed Extract, Benzyl Alcohol , Oleanolic Acid , Linalool , Limonene , Coumarin , Eugenol , Citral .